Elf Khurafeh Shrine is proud to present monthly comedy shows starting in February of 2019! 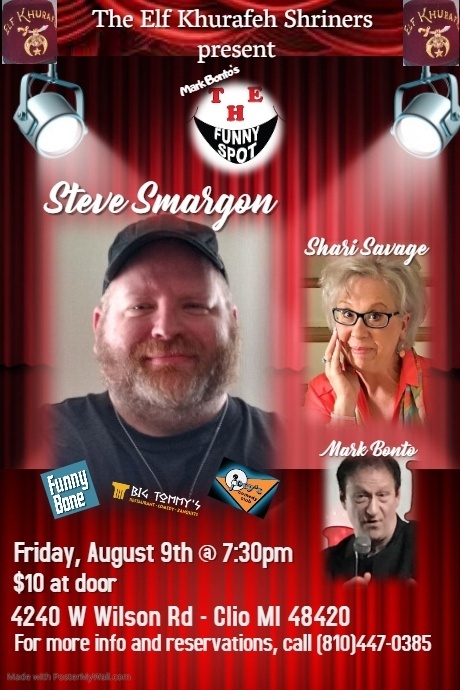 Illustrious Sir Ryan Stanley and High Priest & Prophet Jeff Downing are working in conjunction with Mark Bonto's "The Funny Spot" to bring shows to both Circus Park in Clio and Shriners Hall in Saginaw. Show formats will vary this year. Some shows will be traditional "Pro" shows, which will include an M.C., feature comic and a headlining comic. Other shows will be "feature" shows, which will have five to six "feature" comics along with an M.C. All shows this year will be adult-oriented shows and admission will be for those 18 and over. Show content may be a bit more "salty" than in years past, so consider yourself warned! Keep your calendar open...lots of laughs to come! Join us for our fourth show of the year on May 10th at Shriners Hall in Saginaw, Michigan! The evening will start with our host and emcee, Mark Bonto. Mark is an extremely high-energy comedian, who is also an award-winning host and emcee. He hosts and produces "The Funny Spot" comedy series, has his own television show “Comedy On Tap”, writes for two publications, radio, podcasts, written four books, a webcast sitcom, and has been in eight major films. Mark looks forward to vacations. Eric Wielinski - With a quick wit and satirical style, Eric pokes fun at the absurdities of life. From broken roads to roadkill, and Facebook to facing a midlife crisis, he finds the Silver lining of comedy in everything. 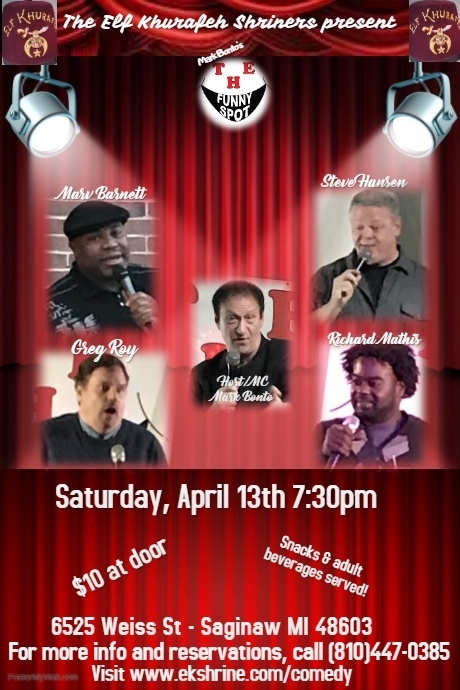 Returning to Michigan after 15 years in Florida, Eric is back bringing comedy with him. Willie Irvin - A native of Saginaw, Willie Irvin has been doing stand-up comedy for five years. Whether it's self depreciation or his unique outlook on things, he manages to find some humor in it and he's pretty sure that you will to. Abby Veitengruber - After hosting her high school talent shows for three years, Abby knew stand-up comedy was an endeavor she wanted to dive right into. Abby is considered a fresh face to the Michigan comedy scene, but is quickly making a name for herself after recently opening up for Rob Little, and winning the Detroit to LA Mark Ridley's comedy contest. Abby plans to keep hitting the comedy scene with her charismatic energy and infectious laugh. Eric Fadie - Eric has been doing comedy for 8 years. By day he works for a successful daily podcast called TheDetroitCast. By night he does stand-up comedy where he tells real life stories combined with his special form of self deprecating humor. He has recently opened for J Chris Newberg and Darren McCarty. ​Luke Nesbitt - Starting stand-up in 2017 after being cut from his college golf team, Luke has jumped in head first. From one-liners to stories about his time in college, he touches on just about everything a kid in his early 20's would experience. Luke has performed in comedy festivals like "Laughfest" in 2018 and 2019, and was a recent semi-finalist in the Detroit to LA comedy challenge. Doors open at 6:30 PM and the show starts at 7:30 PM. Tickets will be $10 at the door. Snacks and beverages will be available for a nominal fee. REMINDER: This show is at our Saginaw location - 6525 Weiss St, Saginaw, MI 48603. Use the parking and entrance BEHIND the building. Join us for our third show of the year on April 13th at Shriners Hall in Saginaw, Michigan! The evening will start with our host and emcee, Mark Bonto. Mark is an extremely high-energy comedian, who is also an award-winning host and emcee. He hosts and produces "The Funny Spot" comedy series, has his own television show “Comedy On Tap”, writes for two publications, radio, podcasts, written four books, a webcast sitcom, and has been in eight major films. Mark looks forward to vacations. Richard Mathis - From Battle Creek, Richard has been doing comedy over 8 years now. He was the winner of the “LA Express competition” and he went to Ridley’s comedy school in Royal Oak, MI. Greg Roy - Greg is not only a stand-up comedian, voice-over actor, and writer, but an avid TV watcher & nacho aficionado. He wrote and produced scores of TV & radio commercials, often featuring comedy icons such as Martin Mull, Fred Willard, Phil Hartman and Dennis Miller. Marv Barnett - Marv has been doing comedy for a little over 2 years. His stories of the joys and pains (mostly pains) of growing up, his wife and kids, and simple life stories will entertain you and possibly question his stability. Steve Hansen - Steve’s comedy style is sharp-tongued, often dark, and frequently self-deprecating. He draws on his experiences growing up as a child of baby boomers in the 70s and living in Detroit, Chicago, Boston, and L.A. He looks for the humor in life’s frustrations and traumas. Steve’s ideal joke is one that makes you laugh . . . and then ashamed for laughing. He performs regularly at venues throughout Michigan and has opened the likes of Tom Papa and Kyle Kinane. 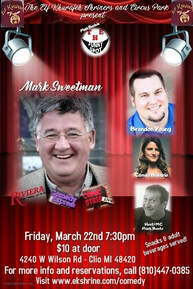 Join us for our second show of the year on March 22 at Circus Park in Clio, Michigan! The evening will start with our host and emcee, Mark Bonto. Mark is an extremely high-energy comedian, who is also an award-winning host and emcee. He hosts and produces "The Funny Spot" comedy series, has his own television show “Comedy On Tap”, writes for two publications, radio, podcasts, written four books, a webcast sitcom, and has been in eight major films. Mark looks forward to vacations. We then welcome comedian and musician Camila Ballario, who is a promising new talent in the Detroit Metro area and has been entertaining crowds far and wide with her fresh brand of stand-up. Formally trained in opera at the University of Michigan in Ann Arbor, she joins her ideas with songs to give you a unique look into her perspective on the realities of being a woman on the cusp of 30. Mark will then bring Brandon Young to the stage! Brandon is a family-friendly comedian based out of Ann Arbor, Michigan who's been able to use a wide variety of topics ranging from strange observations to growing up in a small town with his weird family and why he despises people who dip french fries into milkshakes, to reach a vast array of people. His intelligently crafted material is a hit with all types of audiences. And then the star of the show, Mark Sweetman takes the stage. A name you might not recognize, but is one of the comedy gems that had come out of the rich comedy pool of talent from Detroit. Having spent many years in Los Angeles as a writer for many different shows and comedians, a few years ago he turned back to the stage to perform - this is what he loves to do. His super dry wit and delivery had made him a favorite at clubs and colleges all over the country. Based in Detroit and Los Angeles, Mark has recently begun branching into the storytelling circuit and is developing television pilots for broadcast and webcast. We'll be kicking off the year on February 22nd in Clio, Michigan. Mark Bonto brings his "Funny Spot" back to Circus Park for fun and laughs. This month, Mark brings Mr. Justin Sullivan (Six String Sully) as the feature comic. A Detroit-area native, Justin Sullivan mixes punchlines and short stories with guitar-backed melodies to the delight of spectators allover the country. He regularly performs in Comedy Clubs, Colleges, Banquet Halls and Hole-in-the-Walls with sticky floors. Justin’s R-Rated, high-energy delivery and sharped-tongued wit leave the crowd rolling in their own shame. Then Mark will introduce the headliner, Kevin Zeoli! Kevin lives by the belief that if you can’t laugh at yourself, stare harder in the mirror. His high-energy humor will lead you on a highway of hilarity guaranteed to leave you laughing, as he serves up his views on everything from life with a child to the current state of the country. Adding visuals, voices and stories, you’re sure to have a side splitting time. His credits include Comedy Central, Bob & Tom radio show as well as Sirius XM Radio. Doors open at 6:30 PM and the show starts at 7:30 PM. Tickets will be $10. Snacks and beverages will be available for a nominal fee.